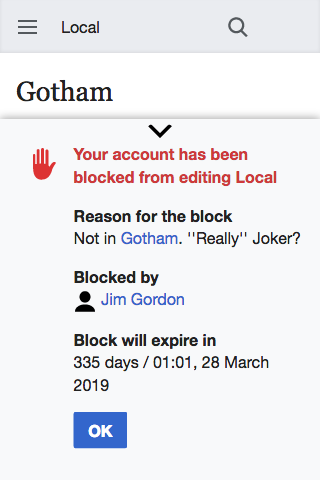 It is essential that all four of the aforementioned pieces of information are supplied to a user when they are blocked. 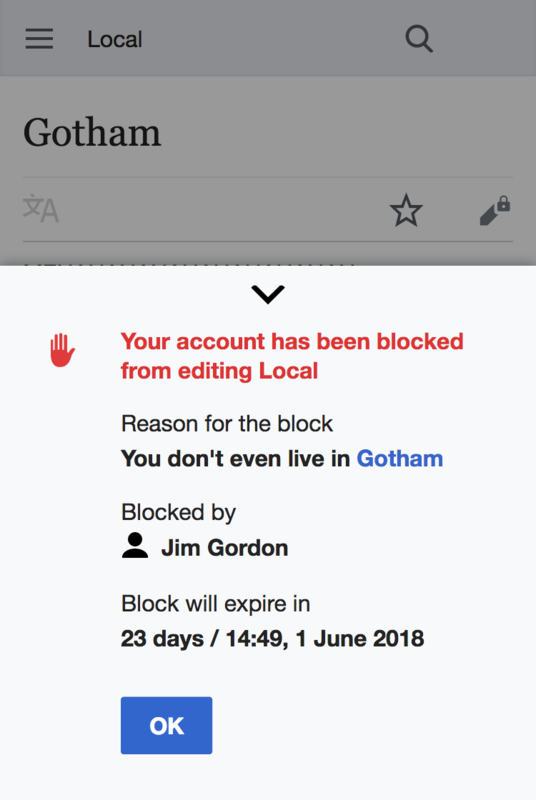 Especially for users editing from shared IP addresses, blocks can affect innocent users, and for users contributing in good faith, a block intended to be temporary (e.g. 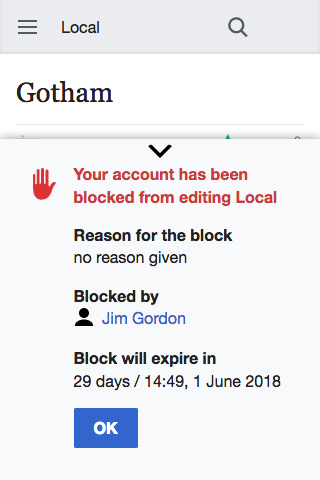 for edit warring) can turn the blocked user away from the project in bitterness if the block is not explained and if avenues for appeal are not provided. 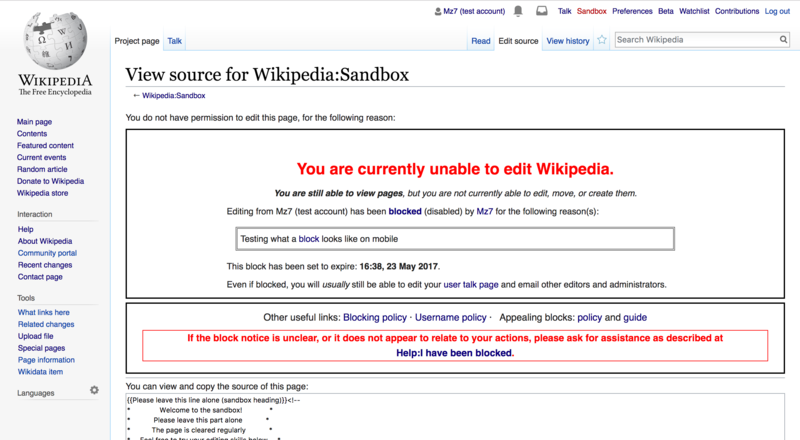 This notice is supplied by the English Wikipedia's interface page MediaWiki:Blockedtext. On a mobile device, however, we have a different story. 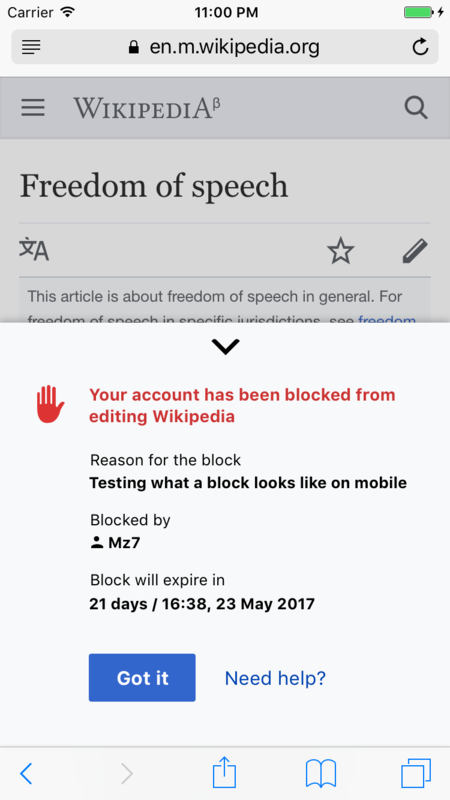 I used Safari on my iPhone 6s, running iOS 10.2, to access Wikipedia using the MobileFrontend and attempted to edit the sandbox using my blocked test account. (This is the same block from when I tried it on my desktop computer.) When I clicked the pencil icon to edit the page, here is what I saw. The notice does mention the administrator that placed the block (me in this case) as well as the reason for the block, but as you can see, the block reason fails to display a hyperlink properly, displaying the raw HTML code for a link instead. Furthermore, the notice says nothing about the expiration date for the block or how the block can be appealed. A drawer should show at the bottom of the screen informing the user they've been blocked and by whom. 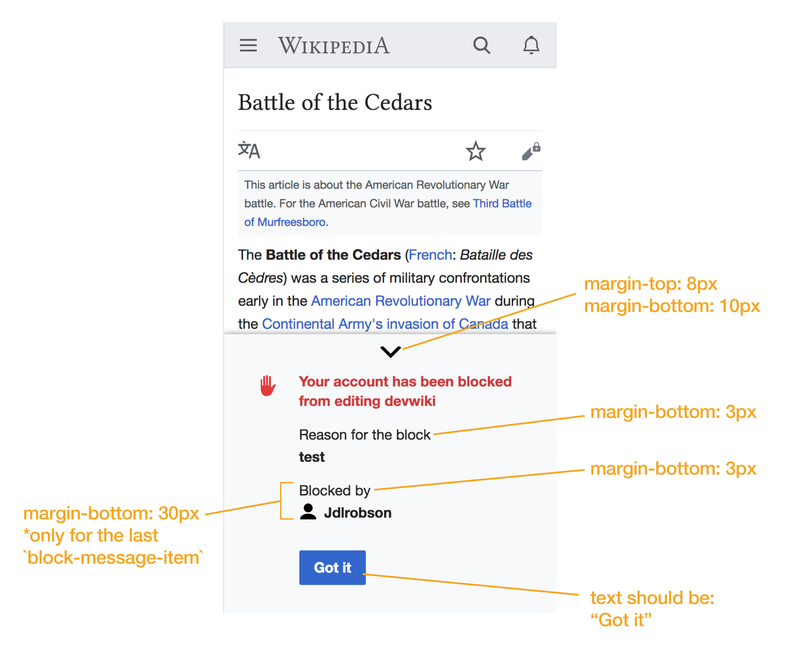 The block reason should display as plaintext, except for links. Links should display as blue links and on tap open in the same tab. Here's what we have. I've moved the "Need Help?" link to a separate task T193173. Are you needing code review from our team? If so please feel free to add the #readers-web-kanbanana-board tag to this task to put it onto our radar! Hey @dbarratt — I'll be handling design review on this so feel free to ping me when you're ready for review. Thanks! @alexhollender hey! and welcome! So @Jdlrobson left some feedback on the patch that I should use the icon library that is in MobileFrontend, however, the icon provided by @Nirzar in T165535#4143873 is not in the proper format. I tried to get in the right format (by making it square and smaller) but I don't think I did it correctly because it ended up being mangled (as you can see in T165535#4158831). Would you mind getting the icon to be similar to existing ones found here: https://github.com/wikimedia/mediawiki-skins-MinervaNeue/tree/master/resources/skins.minerva.icons.images/ ? Here's what we have with @Jdlrobson's requested changes.. the only change I haven't made is to the icon because it's not in the proper format. @dbarratt I've attached the icon here. Let me know if that works better. Also it looks like we normally set the icon color via css, so I made it black. Is there any way for me to pull up the feature on my own machine to review? @alexhollender loaded this up on staging. 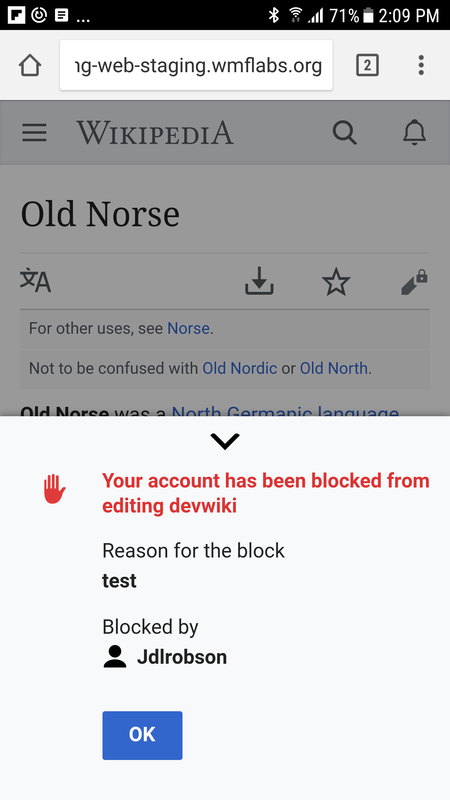 Please use the BlockedUser account. 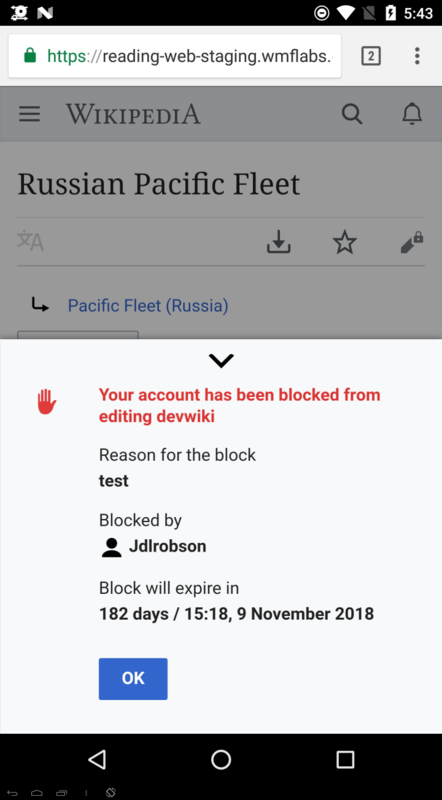 Should the block notice drawer be moved up into the extension or should the extension not handle this (errr... fire an event?) and let the skin handle it? 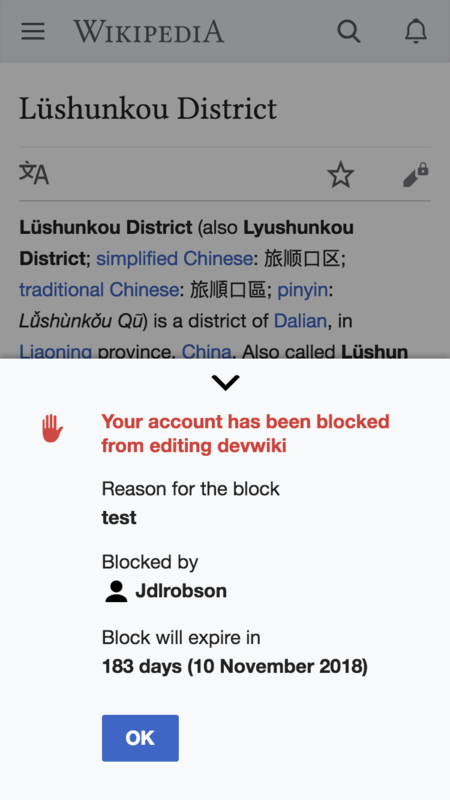 Regardless, it might be better to make IP User Block Notices on mobile a separate task if @TBolliger is fine with that. 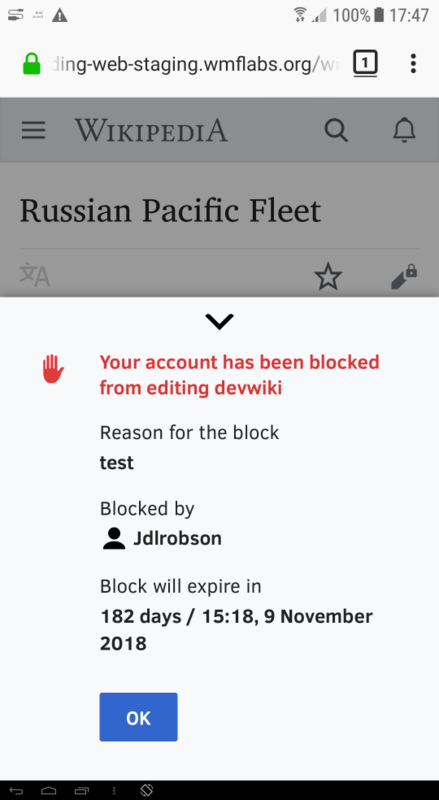 dbarratt added a parent task: T193754: Block notices for IP Users on mobile web should use block notice drawer. @dbarratt looking good. I made a few notes on the screenshot you posted (I checked staging but it doesn't seem to be as up to date as the screenshot you posted). Also — I know that we use this tray component in other parts of the app (e.g. if you're logged out but try to "star" a page). I was wondering if updates you make here are specific to this instance of the tray, or if you can make more general updates? It'd be great to keep all instances as consistent as possible (e.g. the amount of spacing between the top of the tray and the downwards pointing chevron). Also, for example, I noticed that in Nirzar's design the background of the page has a transparent dark overlay, bringing the attention more to the tray. If we implement that here, it'd be great to make sure it's part of the tray component globally. Also — I know that we use this tray component in other parts of the app (e.g. 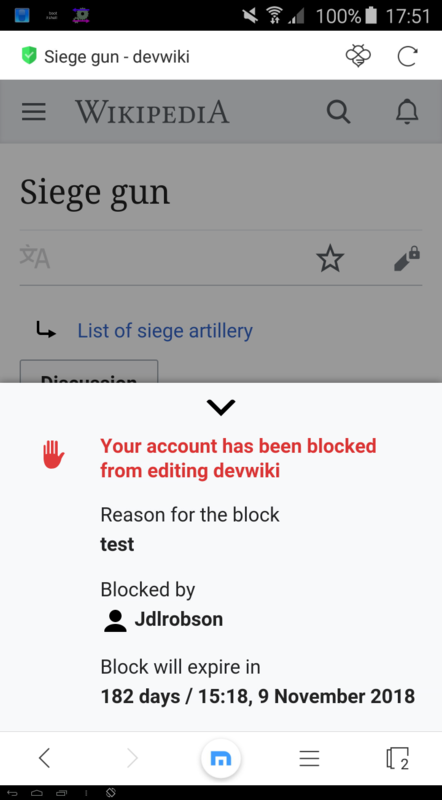 if you're logged out but try to "star" a page). I was wondering if updates you make here are specific to this instance of the tray, or if you can make more general updates? Also, just a note, my screenshot is not the same dimensions as @Nirzar's, I used the minimum screen width (320px) would you like one that is the same dimensions? 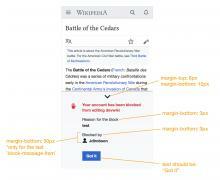 @dbarratt probably what would be best is for me to review the feature on staging. I think most of the comments I left are still helpful though, so maybe let me know once you've had a chance to make some of those updates and then put it up on staging for review? @dbarratt @alexhollender when the new patchset is up I can put it on our staging environment for testing. I propose that we move forward by making these adjustments to all drawers if Alex, Jon, or someone else can help with QA for other drawer instances. @TBolliger @dbarratt — ok, the only change we'd need to cascade (if we made it) would the dimming the background of the page when the drawer is open. Otherwise nothing proposed here will cause this drawer to be out of sync with others. If we want to take the dimming feature on here I'm happy to QA the other instances, but I'd say it's not at all critical. 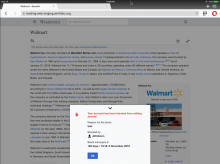 https://reading-web-staging.wmflabs.org/wiki/Security#/random . 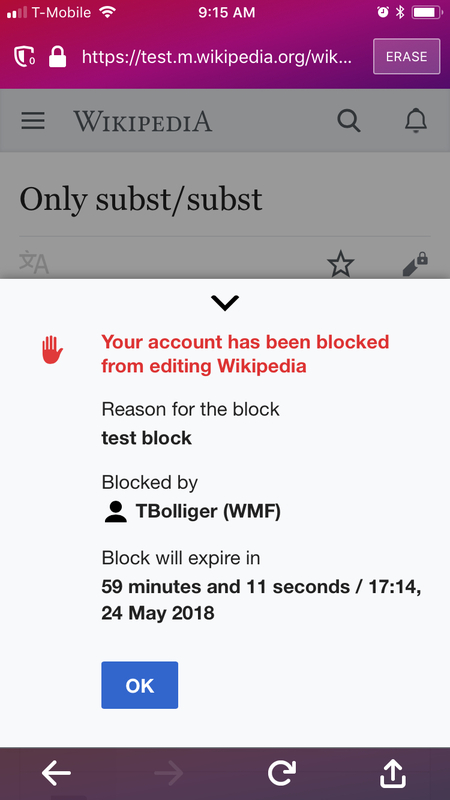 Test using the BlockedUser account. Also, to confirm, are we not doing the "Need help?" link? I believe I've made all the requested changes, Please let me know if I missed something. @alexhollender I converted your pixels to em, but it should be the same amount of space. @alexhollender I'll commit to getting this merged today. I've refreshed staging again with the latest adjustments. This is a new palette color. Do you know what name it has on the style guide and if it is has (or needs) a corresponding variable? @alexhollender and @Nirzar right now I'm using #ce3a3a for the red title text, is this the correct color or should a different color be used? If it's correct, do you have an answer to @Jdlrobson's question? • Jdlrobson reassigned this task from dbarratt to alexhollender. • Jdlrobson added a subscriber: dbarratt. Since it's in our process, this will needs to go through one final design review and QA before resolving to check we haven't broken anything else. 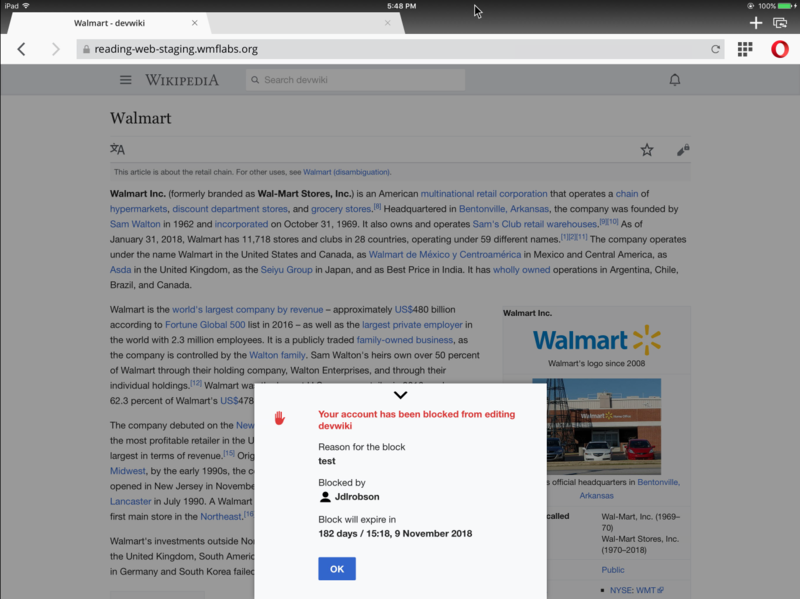 I've deployed the code to https://reading-web-staging.wmflabs.org/ @alexhollender can you check it and then pass to Anthony? @Jdlrobson @dbarratt: just checked on Android and iOS — both look good. 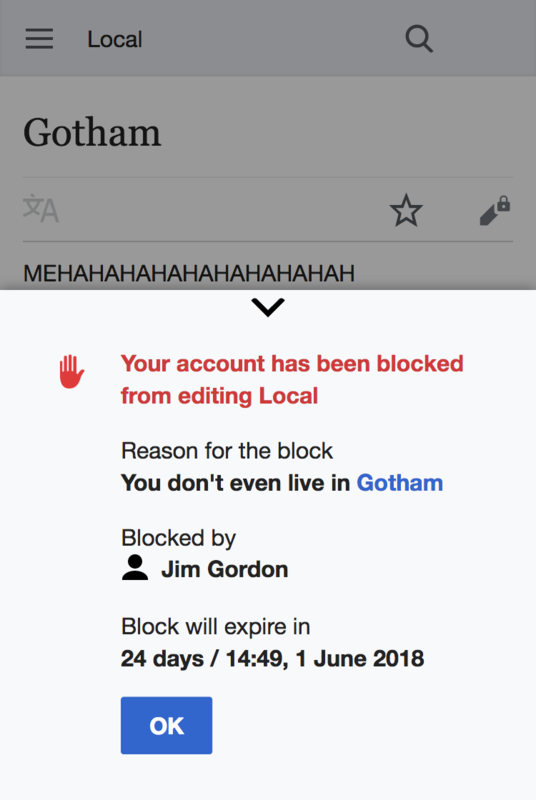 For me the "block will expire in" element is missing, which I assume is due to the type of block not an issue with the feature, however if we want to be thorough with testing it'd be great if I could see that as well. For me the "block will expire in" element is missing, which I assume is due to the type of block not an issue with the feature, however if we want to be thorough with testing it'd be great if I could see that as well. 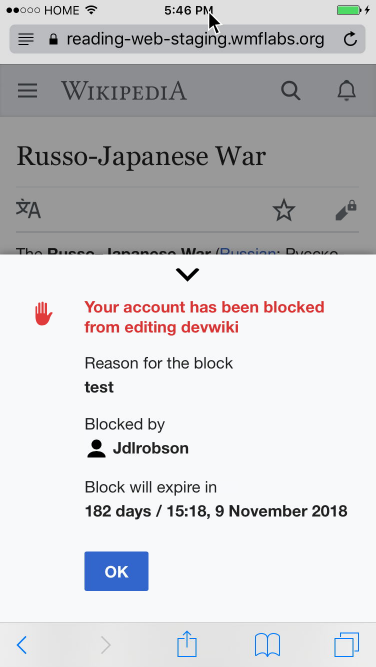 This is because the block is infinite (it has no expiration), @Jdlrobson should be able to add an expiration to the block which will make the line appear. TBolliger moved this task from Review to Done on the Anti-Harassment (AHT Sprint 20) board. looks great. Going to move this to QA. @ABorbaWMF testing steps are in the description. We could reject this preference and set a custom date format, but it would need to work across all languages. I believe we have all of the months translated, so it's more of a question if the format is acceptable in all languages/cultures. is the exact time is necessary? 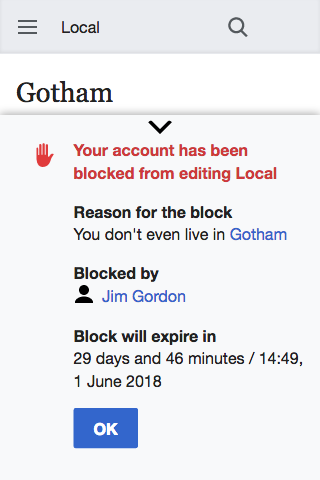 Most blocks appear to be in days, not hours. But I think a perfect situation would be "show only days until it's less than 24 hours, in which case show the exact expiration time" but this sounds like overcomplicated logic just for this ticket, which has already faced enough delays. As PM I say ship as-is. The relative time will always show the greatest unit (i.e it will show "days", "years", "minutes", etc. ), I think what @alexhollender is asking is if the exact time (precise, not relative) of expiration is required. Given our work on T132220, I would say that giving a precise time (as well as a precise date) is required. Oh, duh, yeah! I meant "show only the day of unblock until <24 hours, in which case show the date + time. Feasible? Looks good to me across a few devices/browsers. Sorry @alexhollender I was wrong, there is a way to get just the user's preferred date it's located in Language::userDate() and we could use that to get the block date in the user's preferred format. I recommend creating a separate issue for this if we'd like to pursue it, it should be fairly trivial. Let's make a new ticket, thank you David. When would you expect to see this in production? Looks all done from this side. @TBolliger - would you like to sign off or should I?